Black sheepskin hat căciulă, white linen straight shirt cămaşă dreaptă, with rows of black geometric embroidery on shoulders. Waist length sheepskin jacket pieptar, decorated with black embroidery along seams and in isolated motifs on back, and with black velvet edging on neck. Summer trousers izmene made of cotton or linen fabric. 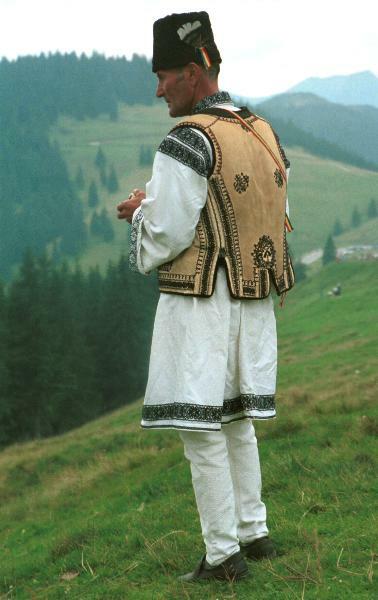 Photo of man from Leșu, taken at Hora Prislop in August 1997.